Part of the CEME solenoid valve range. METAL Work Australasia has been appointed the sole distributor and stockist for the Italian brand "CEME" solenoid valves. The valves cover almost all fluid control applications, and include a comprehensive range for water, steam, air and refrigerating fluids. Various voltages are available and, according to the application, suitable seal materials will be selected. Available are NBR, Viton, EPDM, Teflon, Grafite/Teflon, and Neoprene. 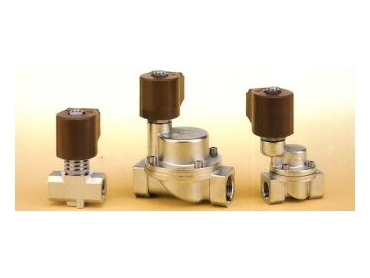 Sizes up to 3"; pressures up to 25 bar and temperatures up to 180°C are part of the range. Meanwhile, due to the rapid market share increase in Victoria, Metal Work Australasia has moved premises. The new office/warehouse, with its 700 square metres of warehouse and 200 square metres of offices at 10 Mickle Street, Dandenong, will allow for the projected growth and increased customer service requirements. According to managing director Franco Toller this is the first tangible step of the company towards a major sale and service organisation in Australia. Metal Work Pneumatic already has its own organisation in Thailand and Malaysia and other countries are presently in consideration. This is in response to the requirements of OEM customers to guarantee parts and service for the components used, when needed, through a local source. Metal Work Australasia 02 9725 3599.